Homemade soup is the epitome of heart warming food and when it’s cold outside on a dreary Monday morning there is nothing better than knowing you’ve got a nice hot bowl of goodness to look forward to at lunchtime. If you’re anything like me and think about lunch as you are finishing breakfast then this is an important factor in your day! I tend to alternate my lunches at work between salads, leftovers from the night before and soup but at the moment salads just haven’t been cutting it for me. It’s too cold and I want a hug in a mug. Does anyone remember those adverts? With the big purple hairy arms? Anyway, this sunday as part of our now almost weekly baking/food prepping session, we decided to make some lovely homemade soup. Soup is really easy to make, I think a lot of people are put off at the thought of whipping up their own but you can make it as easy or as complicated as you like. With this recipe you can do it one of two ways. 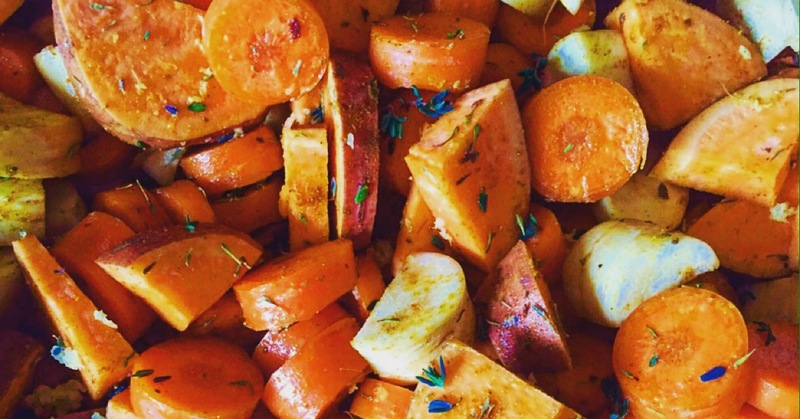 The first is by roasting the carrots, parsnips and sweet potato in the oven with some olive oil, thyme, honey and mild curry powder. The other and notably easier option is to throw all of that into one big pot with the rest of the ingredients and let it bubble to it’s hearts content. The flavours will be stronger if you roast the veg but if you don’t have loads of thyme on your hands (excuse the pun) then go for the latter. “Souping” is said to be the new trendy foodie thing in 2016 (personally I’ve always thought it was great!) and with a variety of different diets and lifestyles, making soup to suit your dietary requirements such as gluten/dairy free, vegetarian/vegan/paleo couldn’t be easier. Or if you are wanting to adopt a healthier eating style or trying to lose weight then soup is a good choice for lunch as it’s really filling and satisfying. Using complex carbs in your soup such as sweet potato will help to slowly release the energy too. Not only is making your own soup much tastier than tinned versions, it’s so much better for your health! You can alter the seasoning and consistency to suit your taste and avoid all the preservatives, salt, sugar and fat that is often added into the processed kinds. It’s also freezes well too so if you make a larger than expected batch as I always do then just put the excess into some airtight Tupperware and pop into the freezer. This recipe makes 8 portions. Roughly chop the parsnips, carrots and sweet potato and season with salt, pepper, olive oil, honey, 1 tbsp fresh or dried thyme and 1 tbsp medium curry power. Roast in the oven for around 30-40 minutes. After 15 minutes of them being in the oven, finely chop the garlic, onion and celery and fry in a large pot over a medium heat with olive oil until soft. If you like some extra heat, you could throw in a chopped chilli or some dried chilli flakes. Once the roasted vegetables are done, add them to the pot with the onions and stock with the remaining curry powder, thyme and a bay leaf (can be dried) if you have any. Leave on a medium-high heat for 20-30 minutes. Finally blend using a hand blender or a food processor to your desired consistency and season to taste! I hope you enjoy this soup as much as I did and that it gives you a bit of confidence to make your own if you never have before!